Hannay, David (1911). "French Revolutionary Wars" . In Chisholm, Hugh. Encyclopædia Britannica (in English) (11th ed.). Cambridge University Press. Holland, Arthur William (1911). "French Revolution, The" . In Chisholm, Hugh. Encyclopædia Britannica (in English) (11th ed.). Cambridge University Press. ^ Holland (1911). 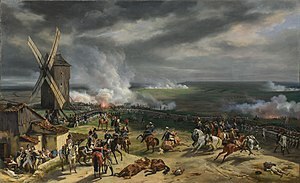 Battle of Valmy..
^ (in Dutch) Noah Shusterman – De Franse Revolutie (The French Revolution). Veen Media, Amsterdam, 2015. (Translation of: The French Revolution. Faith, Desire, and Politics.Routledge, London/New York, 2014.) Chapter 7 (p. 271–312) : The federalist revolts, the Vendée and the beginning of the Terror (summer–fall 1793).